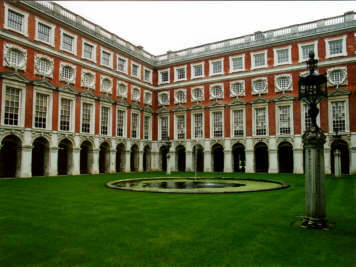 Hampton Court Palace lies in Outer London, in a curve of the Thames. You can easily reach it by train from Wimbledon Station. 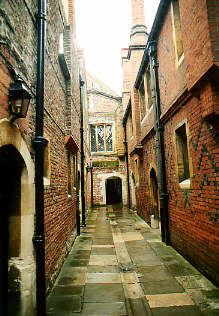 The first buildings were built in the 16th century. In 1514 it was bought by Thomas Wolsey, the Archbishop of York. 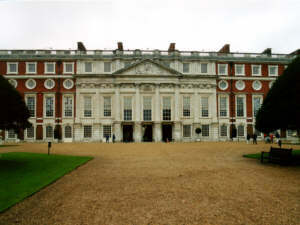 He rebuilt the place into a palace which was so beautiful that the king himself grew jealous. Of course, it's dangerous to make the king jealous. 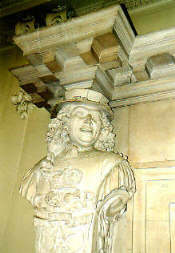 So, some time later Wolsey fell from power and died. The king took care of the property and built some more pieces to it. 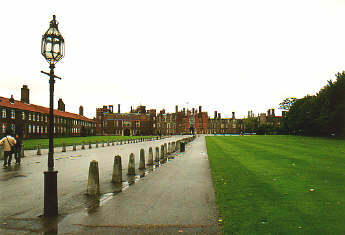 Today, Hampton Court welcomes its visitors. The guides are dressed in the clothes of the period they tell about. If you're lucky, you might see are musicians playing old instruments. Also you can take an audio tour: you get a CD-player and press the button of the tour you want. If you want to know more, you can often choose an extra explanation. The only thing we missed was how to choose less information. If you want to skip the story of one of the rooms, it is hard to pick up the trail, because the numbers of the tour are nowhere to be found. Something that must be in every palace, but you rarely see, are the kitchens. 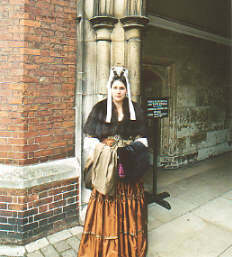 In Hampton Court one of the audio tours is through them. There is a big model of them, explaining the ins and outs of supplying 600 people of two meals daily. The kitchens itself look as if the cooks have just left for a minute, the fire is still burning, and the fish is ready to bring to the lords. The CD tells us all the details of how to make custard without hard bits (yes, that was one of the pieces of the audio-tour we wanted to skip). Each side of the palace looks different. At the main entrance it has red bricks and lots of chimneys, but on the garden side is has a classicistic look with white marble. There are also different looking gardens: the one with the shaven trees, a landscape garden, a garden with a lot of flowers and there is even a labyrinth (always nice for court ladies with more time than duties). Inside the palace, we especially liked the King's Guard chamber. This chamber was decorated with the weapons of the guards. There are more than 3000 swords, muskets, pikes, pikes and whatever their names are, all displayed in geometric patterns. We've never seen anything like it. Too bad this was one of the areas it was forbidden to make photographs. Sorry, no pictures. When we went back to London, we discovered the train to Wimbledon goes further to Waterloo Station, which is a lot faster than the underground.